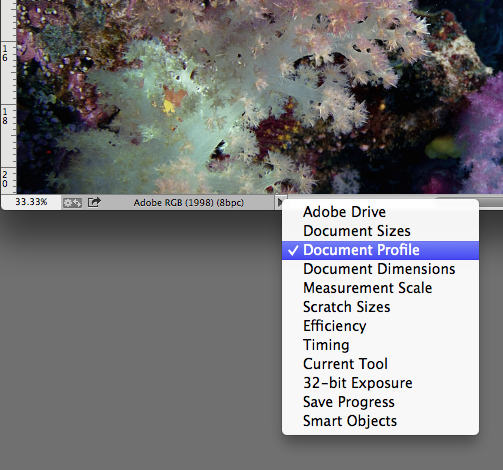 A step by step guide on how to prepare a black and white file in Adobe Photoshop. We are going to show you how to set-up your image files for printing in B&W at theprintspace. Preparing image files for B&W printing is slightly different than colour images and in this guide we will explain the steps to get the most out of printing your B&W imagery. To get the most neutral results when printing B&W images it is best to use the default colour profile Adobe RGB 1998. To check the colour profile of an image in Adobe Photoshop, locate the triangle at the bottom left hand side of the image window and select document profile. Now, in the status bar the ICC profile associated with the current image in the window will be displayed next to the triangle. When printing B&W and you have a colour RGB or CMYK file you must first remove all the colour information. To do this go to Image >> Mode >> Grayscale. 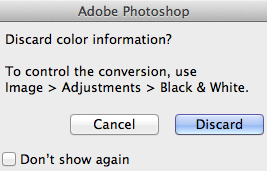 A pop up box will appear asking you whether you want to discard the color information - select discard. This turns your file to greyscale, essentially B&W. Now we must convert our file back to Adobe RGB 1998 for printing as at the theprintspace we cannot print directly from greyscale files. 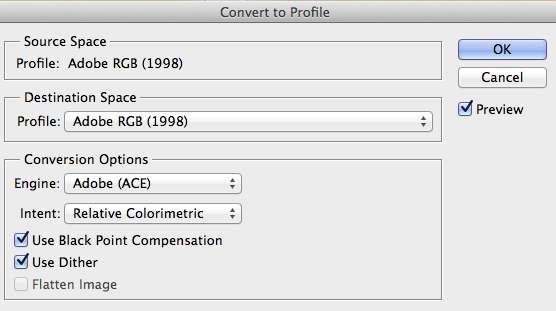 In the Destination Space: select Adobe RGB 1998 and the conversion options below should all be set to the default. Go ahead and select ok. Now, if you look in the bottom left hand corner you will see our file is back in the correct profile Adobe RGB 1998. Next we will describe the process of soft proofing: using our custom print profiles which can be downloaded from our website. Soft proofing is an onscreen preview of how you file with print on your chosen paper. For B&W printing it is most useful for contrast and brightness adjustments. Once you have installed the profiles you can access them in the soft proof menu in Photoshop by going to the top menu and selecting View Proof > set-up Custom. A pop up box will appear entitled ‘Customise Proof Condition’. For Device to Simulate select the profile from the list of the paper you're going to print on. In this example we have chosen the Hahnemhule Photorag paper. Make sure preserve RGB numbers is unchecked and the rendering intent should always be set to Perceptual when soft proofing for B&W images. Make sure Black Point Compensation is checked and under in the display options that simulate paper could and simulate black is unchecked. Now if you move the pop up box to the right slightly and click the preview on and off you will see how the image is affected by the chosen paper type. It is good to see what areas in the images have been impacted by paper choice so we can address them in editing before printing. Remember each paper will affect your image file in different ways based on the paper characteristics. Once you are happy, select ok and notice at the top of the image window the soft proof for the image profile is loaded correctly. However, if you look at the bottom of the image window, the file is still in the profile Adobe RGB 1998 but we have soft proofed for contrast and brightness using the image profile. Now is your chance to make any adjustments to the file based on what you have seen from the soft proof. In this example we are going to add a little more contrast to the file by increasing the blacks and lifting the mid-tones and highlights slightly. That’s how easy it is to prepare your file for printing in B&W at theprintspace. The file is in Adobe RGB 1998, which is the correct profile to use and we have soft proofed and adjusted accordingly for contrast and brightness. The difference when printing in B&W as opposed to colour is: you must not do the profile conversion by going to edit >> convert to profile when printing in B&W. You must leave the file in the default Adobe RGB 1998 colorspace for most neutral results and just soft proof your image. TIP - Need a recommendation? Client favourites for black and white printing include the Hahnemüle Pearl with it's smooth orange peel texture and a bright neutral white base, it creates really natural black and white images. As well as the Hahnemüle Photorag with it's super matt finish of makes this paper one of our most popular papers amongst artists, illustrators & photographers alike. The paper gives muted blacks with even colour reproduction, and excellent detail. Still unsure about the best way to print your black & white artwork? Get in touch with us today!